BOISE, Idaho– Eight state department of transportation projects in California, Colorado, Montana, New Mexico, North Dakota, Texas, and Utah are winners in this year’s second regional contest in the America’s Transportation Awards competition. The announcement today was made at the 2015 Western Association of State Highway and Transportation Officials annual meeting. The projects won in each of the competition’s three categories: Best Use of Innovation, Under Budget, and Quality of Life/Community Development. The America’s Transportation Awards – co-sponsored by AASHTO, AAA and the US Chamber of Commerce – annually recognizes the best of America’s transportation projects in four regional competitions. – The 10 regional winners with the highest overall scores will compete for the National Grand Prize, the People’s Choice Award and $10,000 prizes to be given by the winners to a transportation-related charity or scholarship program. 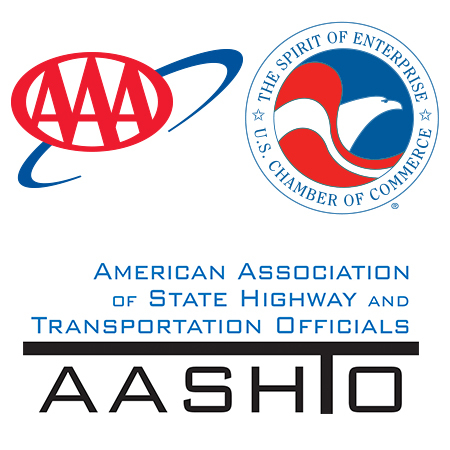 The top two national winners will be announced in September at the AASHTO Annual Meeting in Chicago, Illinois. Winning in the “Best Use of Innovation,” category: New Mexico Department of Transportation‘s $93 million Paseo del Norte/I-25 Reconstruction: medium size designation. The project’s design-build process cut the construction time by nine months and it also created a seamless transition between the overpass and roadway. Montana Department of Transportation‘s $2.75 million Deep Creek Canyon Weekend Bridge Replacement: small project designation. This project created shaft foundations outside of the existing bridge footprint in advance of bridge removal and used precast bridge pieces to significantly accelerate the construction process. Winning in the “Under Budget “category: Texas Department of Transportation‘s $2.1 billion North Tarrant Express: large project designation. This project rebuilt and expanded 13 miles of the Dallas-Fort Worth area’s most congested highways. This public-private partnership project cut construction costs and state officials estimate it will save taxpayers $12 million annually in maintenance costs. Colorado Department of Transportation‘s $55 million Westbound I-70 Twin Tunnel Widening: medium project designation. This project was completed $7 million under budget. It widened the westbound tunnel in one of Colorado’s most important routes for tourism and commerce. Utah Department of Transportation‘s $14 million I-15 US-91/1100 South Interchange: small project designation. This project replaced a 40-year old interchange with an innovative design which relieved congestion and improved safety for the 20,000 vehicles that use the interchange daily. Winning in the “Quality of Life/Community Development, category: ” California Department of Transportation‘s $225 million US 101 in Prunedale: large project designation. This project improved safety for motorists, cyclists and pedestrians by separating US 101 from local roadways through a system of overpasses. North Dakota Department of Transportation‘s $130 million Watford City Bypass: medium project designation. An oil boom in the region created major traffic congestion and safety issues that were addressed by this roadway improvement project. Utah Department of Transportation‘s $13 million Bluff Street at Red Hills Parkway Interchange project: small project designation. This project improved safety for motorists, pedestrians and cyclists by creating a safer passage through this busy intersection.